It was enough to melt the heart of the most hardened detective at Blackpool Police Headquarters when angelic voices filled the rafters. The children’s choir from Great Ecclestone Copp School were part of a day-long charity event held to raise funds for young victims of serious crime. In all, more than £800 was raised for children’s charity Embrace Child Victims of Crime (CVOC) which will be used to fund Christmas gifts for children across Lancashire. 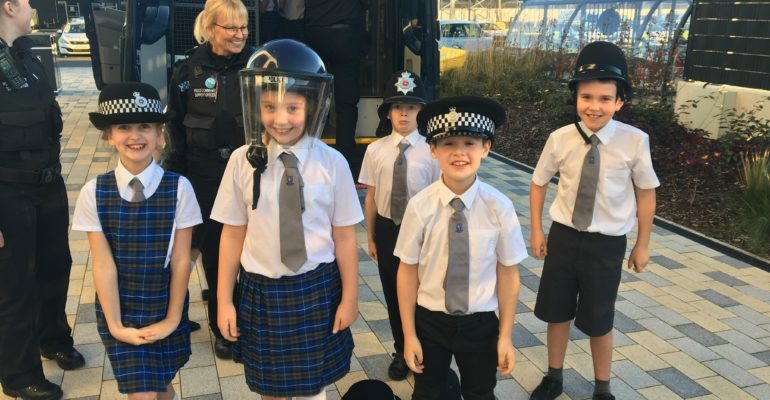 The event, held on Monday November 26 at the new station in Marton, was organised by Detective Constable Kat Knock from the Blackpool, Wyre and Fylde Child Abuse Team, as part of Child Protection Awareness Month. “Embrace CVOC is a fantastic charity that helps children and families across Lancashire cope and recover from the impact of serious crime,” she said. Embrace CVOC is the only national children’s charity which is solely focused on supporting young victims of any crime, anywhere in the UK. Children and families can receive help including access to counselling and other specialist therapies, practical support for households on low incomes, as well as day trips, weekend breaks and other leisure activities – known as ‘cheer up’ support – giving them valuable time together to build happy memories. In 2017, 58 children and families across Lancashire received support including those affected by homicide, sexual abuse, domestic violence and terrorism offences. The charity’s seasonal appeal called ‘Dear Santa’ allows children to choose their own gift, worth up to £50, which the public can then buy them directly from Amazon. Embrace will wrap and deliver the gift from Santa in time for the big day – along with supermarket vouchers, where requested, so the whole family can enjoy Christmas trimmings. Anne Campbell, Chief Executive of Embrace, said: “We want people to get behind our campaign to give back this Christmas and bring joy and hope to some of the most vulnerable children in their local communities. More than 25 local businesses across Blackpool and the Fylde Coast donated raffle prizes towards the event. To buy a Dear Santa gift visit www.embracecvoc.org.uk/dear-santa. The deadline for nominations from police and safeguarding professionals is Monday December 10 – to make a referral visit www.embracecvoc.org.uk/refer-now choosing Dear Santa in the drop-down list. A separate form is required for each child. All eligible gift requests will be funded.